So you’re out with friends on a Wednesday, you’ve had a few drinks, and one of you says “Let’s go dancing!” at 11:45pm. Where do you go? With a handful of options available, we bring you one of the best clubs in town. Swanky interiors, the best of booze and a terrific sound system – we explore why Miami is a great choice for some drunken memories. With a handful of establishments to choose from in the area, Miami stands out as a place for a drink or two and a night full of heavy dancing. What seems like a dull, grey modern day office space in daylight becomes a club heaven once the sun sets. Spread over 15,000 sq. ft the club boasts of a big dance floor and plush black, white and mahogany interiors. In a truly lavish fashion, expansive couches with silk upholstery adorn the area behind the massive bar at the club while bar tables and a dance floor greet you out in the front. The neon lights that line the entrance give an additional elegant touch to the clubs atmosphere. There is also a stage area for the artists and live bands to perform. Miami is for the wealthy, affluent, well-dressed people, and is a spontaneous venue for A-listers. You can head here to enjoy electronic, trance, house and commercial music on most nights. 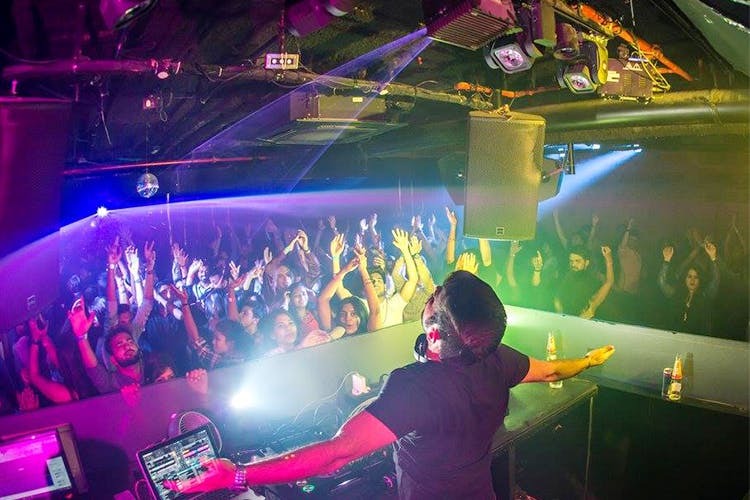 Apart from homegrown talent, Miami has seen some of the world’s best artists perform for Pune. Wednesday nights, aka Ladies Night, are popular with the women who are in for free drinks. The bar is usually crowded but the service remains unaffected. We suggest you opt for the Long Island Iced Tea, a popular favourite here. Timings: 9.30pm to 1.30am (Wednesday and Friday) | 9.30pm to 2.30am (Saturday). Entry: Rs 1,000 for a couple and Rs 2,000 for stags (Wednesday and Friday) | Rs 2,000 for a couple and Rs 3,000 for a stag (Saturday). The prices are full cover, which includes drinks and food. Ladies can enter for free on Wednesday and Friday. Reserve a table if you wish to enjoy a dinner and some privacy. If it’s just a night of dancing that you’re in the mood for, there will be no need to make any reservations (Pre-game at budget eating joints around the club before partying the night away at Miami.) Parking is not an issue since the valet parking at J. W. Marriott takes care of your parking woes.